Something I seem to get asked a lot is, "What headphones are good for <insert price>?" That's not an easy question to answer, thanks to a number of reasons. I'm also reluctant to give direct recommendations due to the fact that a lot about headphones (quality, sound, value) is subjective. What I find good, someone else may find not so good. With that in mind, I want to go through a few points which will hopefully help you to make your own, informed decision. Here are some of the things you should consider when looking for headphones. This is possibly the most obvious point, but one that should be covered. Not all headphones are created equal, and by that I mean they have different sound signatures (a fancy phrase for the tone they impart onto the music). You are probably aware of the fact that headphones and speakers all have different sounds, and may have put it down to a difference in quality, but it's most often, simply down to how they respond at certain frequencies. We can put headphones into two basic categories (there are more, but we are going to keep it simple for now). Those are neutral, and coloured. Neutral, as the name suggests, presents the music as close as reasonably possible to the original recording. It's difficult to make and tune neutral headphones due to various factors, so you do have a degree of variance between them. Not all neutral headphones sound exactly alike. As for coloured, this basically describes any headphones or speakers that add their own tone to the music. The most common example of coloured headphones are those that boost bass, but it can also describe non-neutral behaviour in other frequencies, such boosting high frequencies which gives an impression of greater clarity. We can determine for ourselves which headphones are neutral or coloured simply by checking their frequency response graph. Here is a frequency response graph for 4 popular headphones. These graphs are generated by playing a standard frequency sweep through the headphones and measuring the output. What the graph shows us is that although the same frequency sweep is played through all the headphones, the output can vary a lot. In a perfect world, neutral headphones would have a straight line at 0dBr, right across the frequency spectrum. However in practice this is extremely difficult, and even the $1400 Sennheiser HD800 can't produce a completely flat line. Generally, anything +/-5db relative to 0db would be considered neutral, and anything significantly higher or lower than that would indicate that the headphones either have a coloured sound or weakness. As we can see, given the +/-5db rule of thumb, the HD800 do amazingly well, staying within that range for most of the frequencies. The K701 do well too, but in comparison to the HD800, it appears that bass and highs are a little under represented (but when you consider there is a $1100 price difference, they don't do bad at all). Moving on, we can see the Sony MDR-V700, which are sold as DJ headphones, have the weakest bass response of them all, and is lacking in the high frequencies/treble department. Ordinarily that would stand out to me as a weakness of the headphones, but given that they are designed to be used in clubs, and support up to 3000mw of power, I wonder if they were purposely tuned this way so they can be played at high volumes without piercing treble or ear rattling bass. For DJ headphones they are fit for purpose, but I wouldn't suggest these to any budding audiophiles (talking from first hand experience). Conversely we can see that the Sony MDR-XB700 apply a large boost of +15 in the bass range. That much of a bias into one frequency range means that it works superb for certain styles of music (notably hip hop or drum and bass), but potentially not so well for others. The boost tapers off at around 250-300Hz which is the usual cutoff frequency for subwoofers, so it's obvious what these headphones were tuned for. The only downside with this much of a boost is that it may leave some low male vocals sounding a little muddy. While these don't appear to boost the high frequencies (in fact it's just below 0db), in comparison to most other headphones, it would sound as though they do since a lot of headphones tend to fall off to around -10db in the 10kHz+ range. 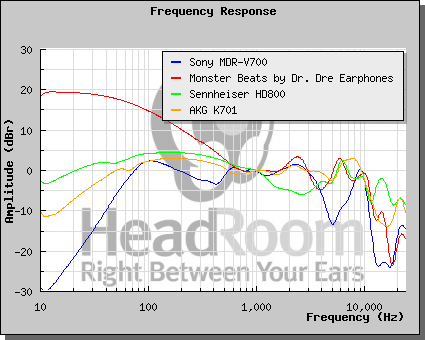 As the graph shows, the AKG K701 and Sennheiser HD800 are neutral headphones, whereas the Sony MDR-XB700 are coloured since they intentionally boost the bass. Coloured headphones are typically a lot more popular than neutral headphones as it's easier to notice a difference in tone between two headphones than it is to notice the quality difference between two that have similar frequency responses. To notice the quality difference between two high quality headphones, you would need an equally high quality source, but the difference between neutral and coloured headphones can be noticed on practically any output. Protip: Coloured headphones work well on cheap players/output as their bass/treble boost can offset the rolloff associated with portable devices/underpowered amplifiers. See this for more detail. That alone makes it easier to differentiate between them. Coloured headphones also give a false sense of quality. What happens when you go from a neutral headphone to one that boosts the bass and treble by +5db? You will easily notice the improved bass, and the extra high frequency response will give the impression of extra clarity. Then move to headphones that boost by +10db and you have the same issue again. The +10 boosted headphones will have even more bass and sound even more detailed than the last pair. These kind of headphones are likely to grab your attention at first which is not something that happens when using neutral headphones. As such, these headphones are popular and thanks to their artificial boosting of the frequencies, can leave neutral headphones sounding dull or flat in comparison. That's not to say coloured headphones are bad or no good, but they serve a different purpose from neutral headphones. My personal preference is to listen to music as it was intended to sound in the studio, but if you are a bass head, then that's cool too. If you listen to certain types of music (such as hip hop or drum and bass as mentioned earlier), then coloured headphones may suit your requirements. If you listen to a wide range of stuff and only want to invest in one pair of headphones, a neutral setup will serve well as a jack of all trades. The great thing about headphones is that they are small enough to own multiple pairs, so you may decide to go for one of each and alternate depending on what you are listening to. As I touched on before in previous posts, your source quality is critically important. There's really no point in spending $1400 on some Sennheiser HD800 if you intend to run them off your onboard laptop audio or iPod. Your output will simply be way better than your input and your source will cripple the performance of the headphones. Budget according to the quality of your setup if you don't intend to upgrade your audio. If you have onboard audio for example, then I'd advise spending $150 maximum. If you have a high end soundcard, then feel free to splash out a little more (let's say up to $250). If you still really want to spend a decent amount (over $300 for example) on a certain pair of headphones, consider buying a DAC first (or an amp if you already have a high end soundcard like the X-Fi Titanium). It makes the initial cost of upgrading expensive, but a high quality DAC is a long term investment and will out live numerous pairs of headphones. A common mistake, and something I can speak about from experience, is that people think they can buy good quality headphones and expect significantly better sound. While high quality headphones will provide an improvement, they will potentially show you the flaws in your source too. I originally bought the AKG K701 and intended to run them from my laptop audio (insert laughter here). I thought that at $320, they would be good enough for me to not care about the pitfalls of onboard audio, or that I would be so impressed with the quality over my old Sony V700, that I wouldn't notice any flaws. That of course wasn't the case, and I soon got the upgrade bug. The audio quality was obviously improved from the Sony V700, but the onboard amp lacked the power to properly drive the headphones, not to mention the poor quality of the DAC. I wanted to see what these headphoneswere actually capable of, so I went down the path of a seperate headphone amplifier and DAC. Audio is a two way deal. Input is equally as important as output, so with this in mind, I'd recommend splitting your budget. I would suggest spending as much on a combined amp/DAC as you would the headphones. For example if you have a budget of $400, rather than spend that much on a single pair of headphones to use with onboard laptop audio, split the budget and buy a DAC too. It's a case of striking a balance since you are more likely to get better quality from a very good source with very good headphones, than a poor source with excellent headphones. You may decide to split your budget dead in half, or something like $150/$250 for example (incidentally, $400 gets you a nice Maverick D1 and AKG K601 combo, which Findns can personally vouch for). I would advise biasing your budget split toward the amp/DAC as they are long term, and headphones come and go. While I am on the subject of source quality, let's talk briefly about the music itself. Once you make the move to high quality audio, you may be left feeling that your 128kbps youtube rips don't quite cut it anymore. Joking aside, MP3 is an aging standard, and what was good enough for lossy compression 10 years ago, is poor now. 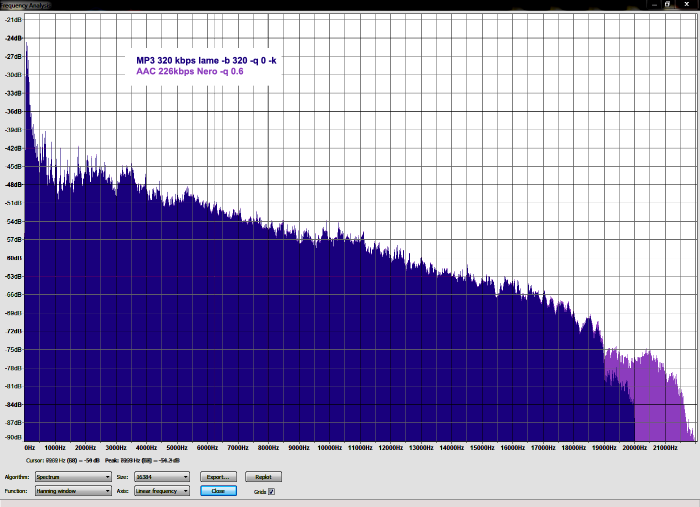 Consider using at least 320kbps mp3, or better yet, AAC or FLAC. FLAC is a lossless compression method that retains all the quality of the original recording, but reduces filesize using similar algorithms to zip and rar, but specially tuned for audio. Typically it reduces the original bitrate of 1411kbps to around 900-1000kbps. AAC deserves a special mention as it is the successor to MP3 and is rather impressive. It is said to be around 30% more efficient than MP3 at the same bitrates, and in an encoding test I performed, I found that 226kbps AAC retained more high frequencies than 320kbps MP3. So if we consider that 226kbps AAC is better than 320kbps MP3, then how good would AAC sound at 320kbps? Even if 320k AAC isn't enough for you, you will be happy to know that AAC goes all the way up to 448kbps for CD audio, and I'd challenge anyone to tell the difference between the source and the AAC in a blind listening test. I'm confident it simply can't be done, especially if you consider that for most people, AAC reaches transparency at around 200-250kbps. I back this statement as I personally find it difficult to find any differences even with my gear. Watch this space for a listening test in the future. AAC also supports multi channel, a range of bit depths and sample rates, and rather than being stuck at a fixed highest bitrate like MP3, it can scale depending on the input. I recently encoded a track from SACD (24 bit, 96kHz) which ended up at 2009kbps, so you don't need to worry that your high resolution sources will suffer from a maximum bitrate. AAC is here to stay for a while. Moving on to the software side of things, I want to talk about a couple of things that affect the audio quality. These are quite important to get right, because they impact the audio before it is even sent to your sound card or DAC. The first thing I want to talk about, and the one that can have the most bearing on quality are equalisers. In my opinion, equalizers don't have a place in high quality audio. When I was a kid, I was under the impression that CDs were simply mastered to sound a bit flat so that they didn't sound overly bright or bassy on different setups. Now that I have got a good quality setup, I realise that it wasn't the CDs that were made to sound flat, it was simply my audio gear that made them sound that way. Consider recording studios. We know that they spend insane amounts of money on high quality headphones and monitor speakers. These are designed to be as neutral and realistic as possible, and the recording is mixed and levels adjusted, according to how it sounds coming from their speakers/headphones. In order to hear what they heard in the studio, we also need a high quality, neutral setup and equalizers have no place in obtaining this goal. Disabling EQ and any other sound processing is especially important when using a DAC. EQ alters the audio levels (and in turn the quality) before it's even sent to the DAC, so the DAC is then forced to deal with pre-processed audio which will give sub optimal results. How can the DAC accurately decode the audio if the contents have been changed before hand? Another, more detrimental effect of equalisation is clipping and distortion which can occur when the level of a frequency range is already close to zero, but is equalised to an extent that would ordinarily cause the level to go positive. For example let's take a bass range that is already at -5db. If we add 10db to that in an equaliser, it will cause it to clip since the audio cannot go above 0db. There are two methods of equalisation. One is to boost the frequencies requested by the user, which can often lead to distortion (such as the example I just gave, and the awful EQ on the iPod). The other method is to reduce the amplitude of the other frequencies, so the higest level of boost actually becomes neutral, and anything lower than that is effectively a decrease. In the second method, adding 10db to the bass frequencies would leave the bass range at -5db to prevent clipping, but all other frequencies would be dropped by -10db to create the effective 10db bass boost over the rest of the frequencies. Some media players with fixed EQ levels already do this, for example if the maximum you can boost a range by is +15db, then you will find that all the frequencies are already at -15db when the EQ is flat to prevent boosting causing clipping. The only downside to this method is that the volume levels are lower. If neutral sound isn't your kind of thing and you would prefer coloured sound, then it's generally better to achieve the type of sound you want through careful choice of amplifier and headphones, rather than using an equaliser. Finally I want to mention media players and codecs. As far as lossless codecs go, your choice of media player isn't that important, but for lossy codecs such as MP3 and AAC, there can be slight differences in quality due to the accuracy of the decoding. Fortunately most media players have a choice of plugins (such as Winamp) or software like Windows Media Player which uses the directshow framework and has a huge choice of decoders available. Windows Vista also introduced a new audio API called WASAPI. In short this is ideal for DACs because it bypasses any OS processing of the sound and allows bit perfect transport. Also of interest is a feature called exclusive mode renderer. While audio is playing using WASAPI in exclusive mode, all other sounds are suppressed, so that means you can listen to music and not be bothered by system sounds, or audio from websites as you browse. Foobar 2000 has WASAPI built into it, and it is available in Winamp via a third party plugin from Maiko, although at the time of writing, Maiko's exclusive mode renderer is incomplete and somewhat buggy. As you are looking round for headphones, you will no doubt encounter some specifications. Although they aren't critically important, they can give us some clues and other useful information. Here are the specifications for the K701 which I will use as an example. Headphones tend to come in two types; open and closed, which refers to the back of the unit. Closed headphones have a solid back and open are usually some form of mesh. Open headphones tend to offer the better sound quality of the two and generally sound more natural (I also feel that closed back headphones cause a little reverb from the sound rebounding off the outer case). Unfortunately, open back headphones typically don't have the same kind of bass punch that closed types have. Open back headphones tend to be more comfortable for long use and your ears don't get stuffy since the air can get to them. The main down side to open headphones though, is that they leak a lot of noise, and also noise can get in easily which makes them poor for outdoor use. Although there isn't anything wrong with the bass reproduction on open back headphones, they can sometimes lack a bit of the punch that closed types offer. In my opinion, open headphones, despite their downsides, are still better than closed. This tells up the lowest and highest frequencies the headphones can produce, however there are a couple of things to note about frequency ranges and why they aren't as important as you might think. The first is that for CD audio, the normal frequency range tops out at 22.05kHz (although digital audio is sampled at 44.1kHz, the nyquist/effective frequency is half of that). The second is that the average range of hearing for a human is 20Hz to 20kHz. That makes the fact that these headphones go to 39.8kHz largely irrelevant when talking about CD audio since there are no frequencies higher than 22.05kHz, and most people can't hear above 20kHz anyway. If you are buying your setup to listen to CD audio, then you should be fine as long as your headphones cover 20Hz to 22kHz. The only thing I could say about headphones with such a high frequency response is that if offers a bit of overhead, so that you know if it can do 39.8kHz, then it won't struggle at 22.05kHz at all, compared to headphones that top out at 22kHz. THD, or Total Harmonic Distortion gives us information about how the headphone perform at high volumes. Basically, it is how the driver is able to respond under a load. A high THD will usually cause popping, cracking or general distortion in how the music sounds. Needless to say, you want this to be as low as possible. Impendance is one of the more useful specifications as it gives us a clue about how easy or hard it is to drive the headphones. Headphones for portable devices tend to be 16 or 24 ohms, and the higher the rating, the more power you need to get the same volume levels. In other words, the K701 at 62 ohms are a lot quieter than my V700 at 24 ohms when using them on my mobile phone. I would say that anything over 60 ohms benefits from an amplifier, and anything under may get away with using the stock output. High quality headphones that have low levels of hiss usually have high impendance as a result, so don't assume that high impendance is a bad thing. This simply tells us the maximum milliwattage the headphones can handle without damage. This is usually not of much interest since at the maximum power ratings for most headphones, it would be so loud it would be uncomfortable, and damage your hearing. Some headphones such as the Sony V700 and XB700 handle up to 3000mw (3 watts), which is probably two or three times louder than most laptop speakers. It should also be noted the the power your amp can deliver to the headphones depends on their impendance. The Yulong A100 for example can provide 1000mw at 33ohms at full volume, but drops to 343mw at 50ohms. Also known as Sound Pressure Level or sensitivity, this is a measure of how loud the headphones are at a given input level. This can also be a bit confusing due to the fact that manufacturers measure this in different ways. Sennheiser and AKG tend to use dB/V, where most other companies use dB/mW. You can convert dB/V to dB/mW with the following formula. Just change dB/V to the value supplied in the specifications and paste this in google search. 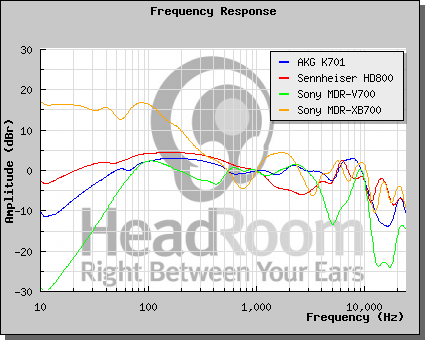 By comparison, the Sony XB700 have 106dB/mW compared to the K701's 99.8dB/mW. This is probably owing to the differences in impendance more than anything else.